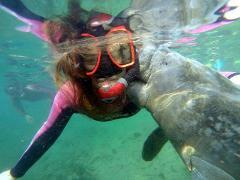 Swim alongside the gentle giants. 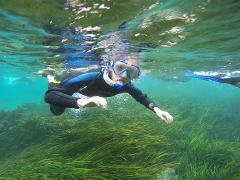 Our tours include: full 5mm wet suits, mask, snorkel, hot chocolate, coffee, water and towel service. All our tours leave from our onsite private docks, with heated changing facility and hot showers!! 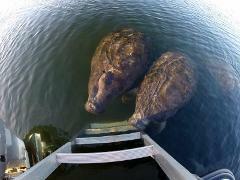 There is nothing better than having the boat to yourself for a manatee tour! The price includes all equipment, full 5mm wet suits, mask, snorkel, towel service, hot chocolate, coffee, hot showers, boat coats for up to 6 people. Just like our regular tours with a smaller group size. The price includes all equipment, full 5mm wet suits, mask, snorkel, towel service, hot chocolate, coffee, hot showers, boat coats and heated changing facility. The one-hour scenic cruise departs daily at 2:30 p.m. (times may vary depending on availability). Cost is $15 per person, and $10 for children under 12. 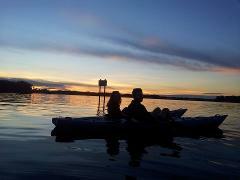 Join us on a beautiful sunset journey around Kings Bay. This tour is only $20.00 per person. Join us on a beautiful sunset journey around Kings Bay. We have single kayaks, tandems, and stand-up paddle boards available. This tour is only $45.00 per person. 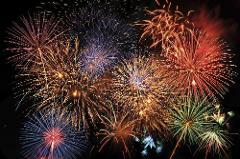 Join us on a beautiful cruise to watch Kings Bay's Firework show! 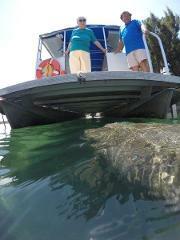 This tour is only $25.00 per person, on our Plantation Princess Coast Guard inspected tour boat.